Girls who steal their boyfriends' shrunken flannel, rejoice! This weekend, Cleveland-born Michael Williams of premiere Americana menswear blog,AContinuousLean.com, will host "a men's market of quality handsome goods." The market, a joint effort between Williams and close friend, Randy Goldberg (of UrbanDaddy.com notoriety), satisfies the pair's insatiable hunger for high-quality local craftsmanship and hyper-curated retail. Says Williams: "Randy and I were at Ippudo one night having pork buns and Japanese beer, and were talking about opening a men's shop together. We both have really similar taste in clothing so it was a natural. The only thing is, we are too busy and too underfunded to open a full time store, so we decided to do it for one weekend only. The rest is history." They may not come cheap, but select merchandise from such crowd pleasers as Billykirk, J.Crew, Alexander West, Rogues Gallery and The Hillside will be peddled alongside Williams' first collection of bags for blog brand, ACL & Co. 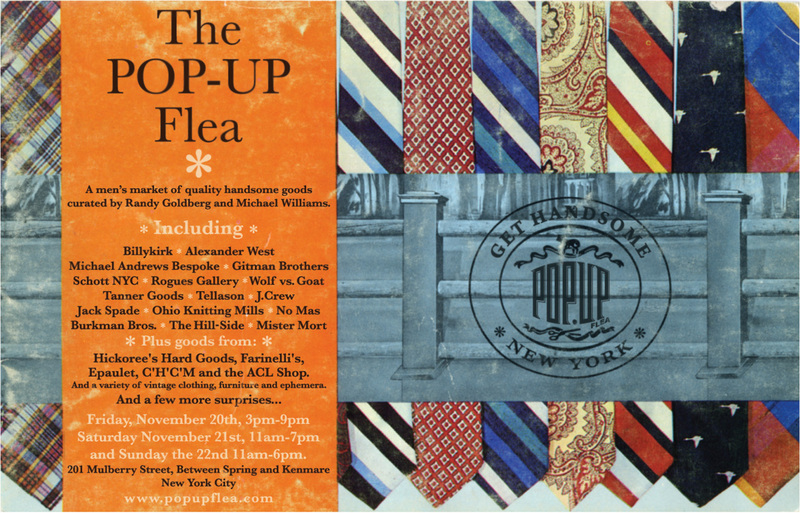 The flier promises "a few more surprises," so high-tail it over to 201 Mulberry Street (between Spring and Kenmare) while the gettin' is still good.